Opening Sentences: There is more than one way to picture a tree. Synopsis: Through her incredible plasticine art (yes, the cover art above is all plasticine, which is a brand of modeling clay! ), and her imaginative, evocative text, Canadian author/illustrator Barbara Reid shows a myriad of ways to think of trees. For example, a street with trees that form an arch over the roadway is a tunnel, while a little boy looking out over the city’s trees from his apartment balcony sees an ocean. Barbara Reid always astonishes me with her illustrations, which are plasticine embellished here and there with a touch of paint. My favorite spread in this book, “A tree can be a high-rise home sweet home,” not only shows many different creatures (animals, birds, wasps, and a kite) living in the tree, but also depicts in detail the high-rise building behind it, with a scene in every window – all in plasticine. I suppose technically this is a concept book, as there is no central character and no story line, but it is a concept book of the highest order. Activities/Resources: A walk outdoors, whether in country or city, to look at trees and think of ways to describe them as Reid does in her book would be an excellent activity to pair with a reading of the book. Barbara Reid’s website has a video that shows kids how to make a basic tree illustration from plasticine. One can also view the trailer for Picture a Tree, and watch a video about the making of the book which features the spread I mentioned above. There’s also a memory game on that page. Having children make their own plasticine pictures, following Barbara Reid’s instructions, would be a perfect ending to a Picture a Tree day. Availability: Some availability of the 2011 edition in Canada. 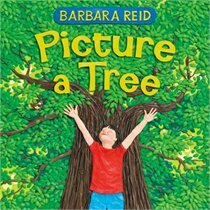 Picture a Tree will be re-released in March 2013, and is available for pre-order. WOW! I can’t believe that that cover is made from plasticine (and I had to google plasticine 😉 )! All Barbara Reid’s art is plasticine, (photographed, of course, not actual plasticine on the book!) — and after you said you’d had to google plasticine, I put a link to Barbara’s explanation of it. I grew up playing with it, so didn’t realize others wouldn’t know right away what it was. Her art is amazing. When I saw the title, I guessed you were the reviewer. Lovely choice and I love the author’s many ways to think about trees. A beautiful share with children. Will help them think of trees differently. Also had to look up plasticine. It is a wonderful book, as all Barbara Reid’s books are. I’ve now added a link about plasticine! Before I clicked on your link, I had an idea-flash and now I’ll have to read it so I don’t write the same story (would have anyway, since your right up is so intriguing!). I’m sure you’d come at the story from a different angle than Barbara Reid did, but I do hope you’ll read the book, as it’s such a good one! CLEVER! The art work reminds of of Suzanne del Rizzo’s work – very impressive! I wasn’t familiar with Suzanne del Rizzo’s work, so I googled. Yes, it’s similar, but I hope you’ll take a look at Barbara Reid’s work — she is incredible! A great review! I see that you must like trees alot. Me too! And I actually have this book on my wish list! The pictures are just too fantastic! You will love the book. I’m totally confident in saying that. I do love trees — I also love Barbara Reid’s work, I’ve been a Reid admirer for years and years. Enjoy the book! This sounds wonderful. I love books that encourage kids to look at things from different perspectives. Thanks for sharing this one, Beth! Thanks, Carrie. It certainly does encourage kids to look at trees from all sorts of perspectives. It’s a very cool book. books. I attended a seminar where she expalined how she creates the pictures. Amamazing! Oh, how wonderful to attend a seminar featuring Barbara Reid! I, too, love all her books. Isn’t she absolutely amazing? Note to self – proof read comments before posting! Sorry for the typos. I tagged you for the LOOK challenge Beth. This looks great, Beth! I love books that encourage readers to look at things from a different perspective and consider other options. The art sounds amazing – I’d like to see it! Thanks so much for adding this to our list! Thanks, Susanna. If you can find ANY of Barbara Reid’s books, I highly recommend them. She is awesome. This looks like a wonderful book for autumn. The boys and I talk about trees a lot as we watch the leaves fall. I think your boys would love this book, Kirsten. Oh, I hope you can find your book, Vivian! And I know you’d love this book, or any other of Barbara Reid’s books. Beautiful looking book and story. I watched kids at a Chinese festival create clay models, very clever. I grew up with plasticine, loved it. Thanks, Diane. It seems as though people in Commonwealth countries are most familiar with plasticine. I loved it, too! At Christmas I’ll post my one attempt as an adult at plasticine art. Sounds amazing – now I’m going to have to try doing some plasticene sculpting, too. Thanks, Beth, one more reason to go to the art store. Oh my goodness! The art is spectacular. And your favorite spread sounds delightful. I love the language. And you made my day by including the two YouTube videos. Amazing! And you made my day with your enthusiastic response! Thanks, Penny! Beth, that’s very very cool!!! What a wonderful journey for young (and not-so-young!!) minds!!! !